Maui Hawaii . . . now there’s a destination full of beauty and adventure. Arnie, my other self, and I both salivate every time we think of once more absorbing the captivating allure to be found in all of the hundreds of well known and often visited attractions on that gorgeous island. Yes, well known and oft visited . . . can’t get enough of those places. But wait . . . there’s more. As settled as the island is, there are still plenty of places that have a wildness about them . . . it’s like stepping back into an untouched past. One can find such spots at the water’s edge off State Highway 30 on the northwest rim of the island. Arnie and I were returning from grabbing a loaf of “Julia’s Best Banana Bread on the Planet,” at Old Kahakuloa Village. Getting to and from Julia’s hut is a hair- raising adventure . . . one of the most challenging daredevil rides you’ll find anywhere. Negotiating that highway may be one reason such lonely, rarely visited spots are still there. But daredevil mountain hugging is another story. I nosed the rental vehicle along a volcanic rock strewn trail toward the ocean until a huge bolder prevented us from creeping further. Arnie carried my trusty digital full-framed Canon 5D Mark II camera. We carefully picked our way through a jagged volcanic outcropping toward the water’s edge. 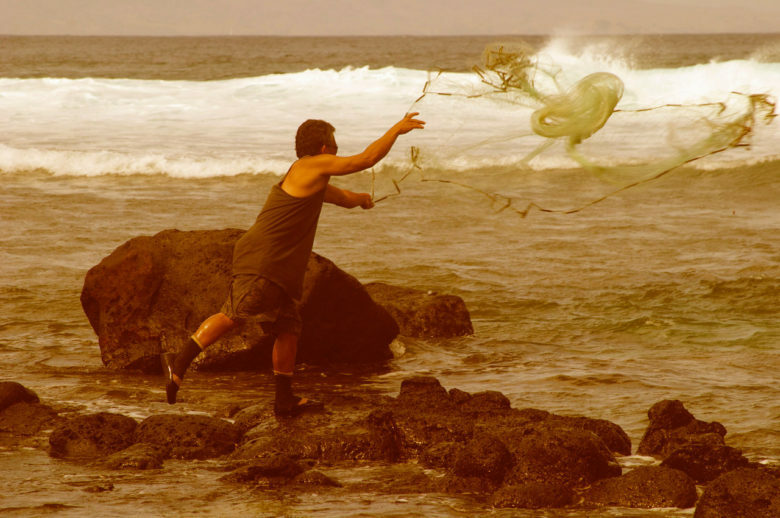 Certain that we had found the end of the world, we were totally surprised to find what looked like a native Hawaiian casting a curled fishing net into oncoming waves. He ignored us. Not wanting to spoil the fisherman’s privacy and wanting to have our own space, we tiptoed through the jagged lava, around the corner and out of his sight. 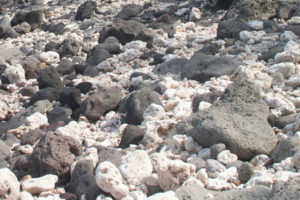 There, a hundred yards or so before us, lay a lava-studded beach crowded with all sizes of bleached-white coral. We stood for a moment stunned at the impressive sight. I wondered why it was all piled up here. Then Arnie burst out laughing. “Don’t you see . . .? ” Arnie continued to laugh. I looked at the chunks of white coral with new eyes, “Yeah, you got something,” I chuckled . . . “There’s Mr. Leslie,” I said pointing at a jolly face. That’s when I understood then that this coral graveyard was another story.